As I have mentioned before, I was generally my mother's sidekick until I began school. My mom was never one to shirk responsibilities, and felt that leaving me to be watched by another adult in her stead was indeed avoiding the role that she took on when she became a mother. That meant if my mom had errands to run, it was adventure time for me. Each new place to a child under the age of 5 can be a world of exciting and often scary situations. Since I knew better than to run amok in public, most of my adventures were silent imaginary scenarios. I had experience playing by myself at that point, so all was well. On one such adventure I found myself on line at a very busy bank. My mother noticing how long the wait was said I could go sit quietly in the nice comfy leather seats reserved for those waiting to be seen by a loan officer. She did give me the caveat, if she looked in the direction and did not see me, all bets were off. I would have to go and stand in line with her and have to answer for disobeying. Believe me, that was not something I ever wanted to answer! So I ventured forth to my new comfy local for the time being. It was an old fashioned leather armchair, the kind with the brass buttons that look like rivets. I always loved those chairs, as they instantly became spaceships, and the rivets became control and flight buttons. After a few minutes of my long term space flight where I would be confined in my cockpit, I noticed something on the floor, behind the row of chairs across the ornate oriental rug that separated my ship from the others. It was red and blue, and could barely be seen as a chunky wooden leg from the armchair was blocking most of it from my view. What was it?! This began a mind crushing period of time. I would look over across the back to the teller line and check to make sure my mom was not watching. I would then fidget and try to obtain a better view of this mysterious red and blue object until I would notice my Mom's gaze starting to turn in my direction. Rinse and repeat. At one point during this struggle with my armchair, I almost fell off. But it was at that very point that I received visual confirmation of what my quarry was... It was Spider-man. 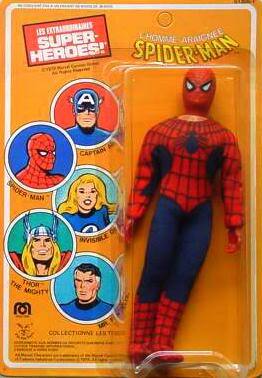 It was a beautiful 8 inch Mego Spider-man that some other child must have dropped. I looked around, but other than an older gentleman sitting a few chairs away from me, who must have thought I was learning disabled or at the very least, plain stupid, there was no one else around in that waiting area. I looked towards the teller line and all I saw were grumpy adults who were not happy to be standing in that never-ending line for ONE teller. From what I could tell, there were no other children in the bank. Spidey was going to be mine! That is, if I could figure out a way to get out of my chair, crawl under a different chair, grab him, and get back into my chair before my mom could notice. Then I would have to explain where he came from! What would I say? I found him? It was the truth, but would my mom let me keep him? What if she made me give him to the bank owner? Then he would have a Spidey to play with. As I sat there going through the scenarios, my mom tapped me on my shoulders. I hadn't noticed she had moved up in line, much less that she had been at the teller window when I last cased out the bank for other kids. With a sigh, I pointed to where the Spider-man was and whispered to my mom that it looked like someone dropped a toy. She walked over, reached behind the chair and smiled at the old man and said straight faced, "My daughter dropped her doll." She handed the Spidey to me and said we'd talk outside. When we stepped out to the cold crisp New York air, she turned to me and said, "Oh well, finders keepers!" Sometimes I wonder about the poor kid who lost that Spider-man, and then I remember my mom. Finders keepers, indeed.